Are you suffering from pain between the shoulder blades and live in the Maroochydore area? Then we’d like to help you. 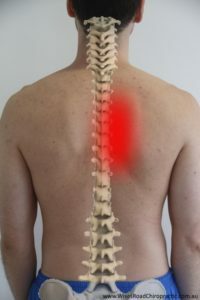 Mid back pain is between the shoulder blades and it can be central on the spine or slightly off to the side. From between the shoulder blades it may go up towards the neck, downwards or even out across the back of the ribs. When the mid back has dysfunction because of it’s relationship to the ribs people can often report a “catching” or pain with breathing or a feeling of restriction when taking a breath in. Sustained postures such as computer work or nursing a baby can contribute to mid back pain. Also lifting or twisting activities even if they aren’t heavy or strenuous can cause mid back issues. Mid back pain is often best addressed by not only improving movement in that area of the spine but also correcting any issuesabove in the neck and below in the lower back that may be contributing and putting added stress on the mid back. Ultimately, we would love the opportunity to help you find the neck pain relief you deserve. When you come in for your first appointment, you will have a consultation and exam with Dr. Leevi (Chiropractor) that is specifically designed to uncover the cause of your mid back pain. If we can help, we will recommend the most conservative and effective care for your unique situation.